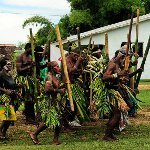 The followers of cargo cult celebrate John Frum Day in Vanuatu annually on February 15. Celebration, as well as the cult, has a long history. The religion concerning Johg Frum arose in the 1930s, when Vanuatu was known as the New Hebrides. The legend says, that a native man Manahivi used alias “John Frum” and dressed in a western-style coat assured people, that he would bring them houses, food, transport and clothes. Other stories say, that John Frum was a kava-induced spiritual vision. However, John Frum's promises would come true, if people of the New Hebrides would object all aspects of European society (money, Christianity, education, work on plantations). The movement gained special popularity in the 1940s, when American soldiers were stationing in the New Hebrides and bringing with them enormous amount of supply (cargo). When Americans departed after the war, the followers of the cult built symbolic landing strips to encourage American airplanes land and bring them cargo. The followers of John Frum religion believe, that his airplane will land on the island and bring them the goods, that the white people have and the latter will eventually forever leave the island. The followers believe, that John Frum has to come on February 15, that is why they annually organize symbolical military parades.